Our constant care for customers, employees and the environment has lead us to obtain several certifications in accordance with recognized standards. The main objective of our company is to provide our customer with high quality standard products and to permanently improve processes, staff competences and the services provided. That's why we obtained the ISO 9001:2015 accreditation, which certifies the implementation of such a Quality Management System. 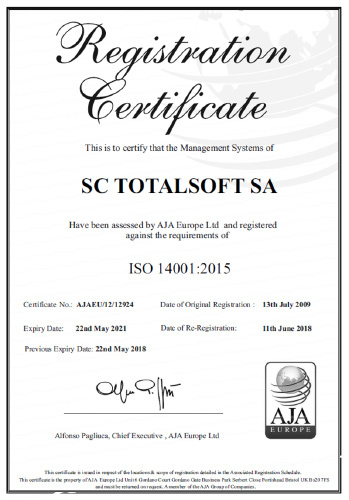 We have taken measures to control the impact of our activities on the environment by implementing an Environmental Management System certified with ISO 14001:2015 standard. Thus, we are committed to address technologies that protect the environment such as recycling and reducing the consumption of energy or other resources necessary to carry out our activities. We promote a safe and healthy work environment, where occupational risks are controlled and managed to the highest standards. In 2007, we obtained a certification on Occupational Health and Safety Management System according to the OHSAS 18001:2007 standard. In today's competitive business environment, information must be permanently protected. The Information Security Management System ISO 27001:2013 ensures confidentiality, integrity and availability of information both for our customers and for the proper performance of the company. 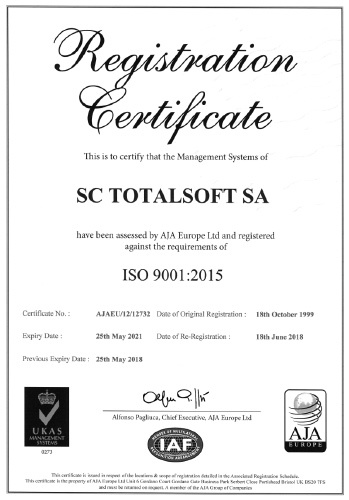 TotalSoft is Microsoft partner since 1997 and starting with 2005, it became Microsoft Gold Certified Partner. During the 15 years of partnership, the company permanently expanded its competencies, operating today with a complex technology suite. TotalSoft is ORACLE partner since 1998, achieving many certifications over the years.